Overlapping teeth occur when your upper teeth extend past your lower teeth vertically. Many reasons for this condition exist, including genetics. Regardless of the specific reason in your case, Invisalign for overlapping front teeth represents the most successful treatment. Your overlapping teeth with Invisalign gradually adjusts to proper alignment. Ask your Invisalign dentist that open on Saturday and Sunday about Invisalign. Sometimes, your mouth is too small for your teeth. This crowds the teeth, causing them to shift. This is most likely a trait you inherited from your parents. Maybe your upper and lower jaw aren’t the same size, or they’re malformed. This results in the protrusion of your upper jaw, resulting in an overbite. It can also cause an under-bite, which is when your lower jaw juts forward, causing your lower teeth to extend beyond your upper teeth. Extra teeth can put pressure on your front teeth, shifting them forward. This is another hereditary trait. Lost teeth and other unusual conditions let your teeth grow where they shouldn’t. Childhood habits — like thumb sucking or extensive bottle use — also cause malocclusion. Improperly fitting dental restorations, including things like fillings and crowns, have been known to cause overlapping teeth. Oral health problems affect the structure of your teeth. This includes gingivitis, which is a gum disease, as well as tumors in your mouth or jaw. When you injure your jaw, misalignment often follows. Over time, your teeth wear unnaturally, causing them to weaken and fall out. You’ll have difficulty chewing and speaking, even if you don’t develop a lisp. You may develop jaw pain, which causes headaches. You may have a tendency toward tooth grinding and clenching, which can have damaging results. Difficulty cleaning your teeth causes an increased amount of tooth decay, which leads to gum disease. You may lose your self-esteem due to the embarrassment caused by your appearance. Dentists open on Saturday diagnose overlapping teeth based on your teeth’s appearance and your symptoms. They take X-rays to rule out other possible causes for your pain. Typically, this all occurs during a routine exam. When overlapping teeth aren’t readily apparent, your dentist may do more X-rays. These include head or skull X-rays and facial X-rays. Sometimes, making diagnostic models of your teeth is also necessary. Eventually, your dentist, skilled in cosmetic dentistry, reaches a diagnosis. In really severe cases, you may need one or more of your teeth removed. Dentists do this when overcrowding is the cause of your overlapping teeth. Surgically reshaping your jaw —using wires, plates and screws — is another option. In the past, dentists placed braces and other metal appliances on your teeth to straighten them. They were the only treatment for overlapping teeth. Today, one of the most commonly used treatment options by a Saturday dentist or a Sunday dentist is Invisalign. This is an effective way of comfortably straightening your teeth. Invisalign consists of a series of aligners, each set worn for about two weeks. You wear them at all times, except when you’re eating, drinking, or brushing and flossing your teeth. Slowly, they align your teeth. Throughout the process, you only visit your dentist once every six weeks for a check-up. The entire process takes, on average, about a year. Fixing overlapping teeth with Invisalign is effective and painless. Do you have any questions about the overlapping teeth treatment fix using invisalign in Yonkers? Would you like to schedule an appointment with the best Invisalign doctor in Yonkers of Park Avenue Smiles of Yonkers, Westchester County? 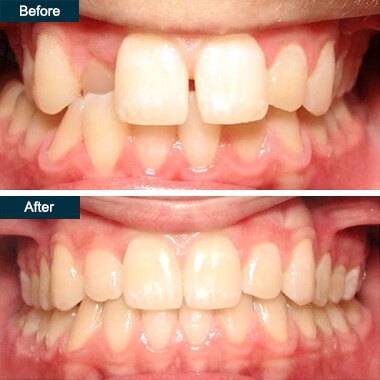 Please contact our dental clinic for consultation with the overlapping teeth specialist.